Construction on the Unalaska Marine Center renovation began in June 2017. In the past, McLaughlin said there was a 10-day cycle of vessels lining up for space at the dock. At times, she said the city would send export ships back out to anchor when Matson’s D7 came in to deliver local groceries and cargo. Now, the Unalaska Marine Center has two additional acres of laydown area. There’s 1,600 linear feet of dock space, 800 feet of crane rail, and 168 hours a week available for scheduling. While the project still has a couple items left to tackle before final completion is achieved, McLaughlin said it’s possible the new dock could see its first users as soon as Wednesday. Cold icy weather is delaying completion of the new city dock. This is the third time the deadline has been pushed back. Most recently, the project was scheduled to be completed by Jan. 15. As the Unalaska Marine Center nears completion, the City Council is thinking about how to lease out the space. "This council and the council before have approved a fantastic project that has built an incredible piece of infrastructure for our community that will last somewhere in the realm of 50 plus years," said Ports Director Peggy McLaughlin at a Dec. 11 council meeting. McLaughlin explained terminal service agreements -- which favor competitive bid processes, but don't require the city to go out for a bid. 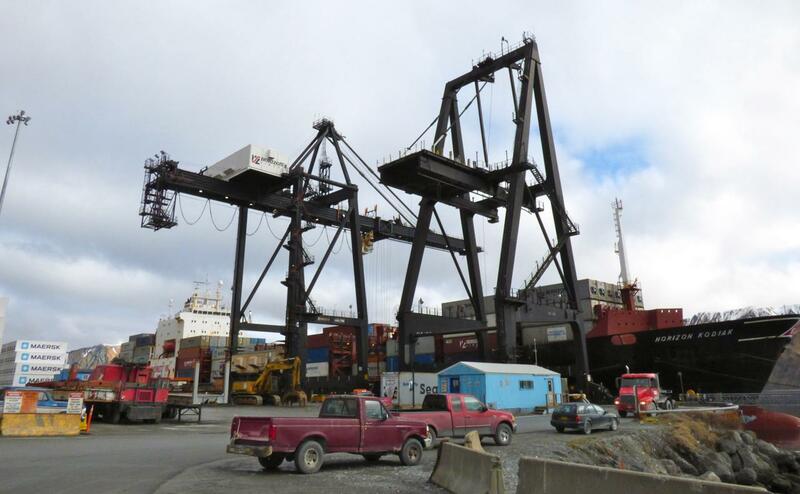 The completion dates for Unalaska's dock renovation have been delayed again. Last week, city officials granted a two-week extension requested by Turnagain Marine Construction, the contractor hired to replace a pair of aging docks at the Unalaska Marine Center. The completion dates for Unalaska's dock renovation are being pushed back one month. On Tuesday, City Manager Thomas E. Thomas announced the city has granted an extension request from Turnagain Marine Construction, the contractor hired to replace two aging docks at the Unalaska Marine Center. Thomas said the company needs more time replace the guardrail and remove boulders and creosote timbers unearthed during construction. Unalaska’s city dock is about to get a major makeover. The City Council approved a $39 million renovation Tuesday night, authorizing top bidder Turnagain Marine Construction to replace two aging docks at the Unalaska Marine Center. After nearly 10 years, Unalaska has taken one of the final steps in making the new Unalaska Marine Center a reality -- finding financing for the $44 million dock renovation. Mayor Frank Kelty pushed the project forward at Tuesday's City Council meeting, after councilors split over whether to partner with the Alaska Bond Bank Authority. Kelty broke the tie and voted to authorize the sale of city bonds worth $35 million, which will be shopped to investors for startup cash.